Automatic CO2 Brix Monitor | ATAGO CO.,LTD. where a container with pierced hole is shaken vigorously in a metal frame. which weighs 8.4lbs/3.8kg in total. The CooRe was developed to simplify this task as much as possible. – Free from "manual shaking"
Traditionally, the amount of dissolved carbon dioxide is measured using a methodology commonly called "manual shaking" (aka piercing device) where a container with pierced hole is shaken vigorously in a metal frame. It requires strenuous physical exertion of shaking a 2L bottle and a metal frame, which weighs 8.4lbs/3.8kg in total. The CooRe was developed to simplify this task as much as possible. 1. World's first, all in one instrument. CooRe is the world's first all-in-one dissolved carbon dioxide monitor that features three functions, piercing a hole in the container (piercing), measuring dissolved carbon dioxide and concentration in a single measuring device. 2. Can be portably used. CooRe can be operated by AC adapter or battery, which makes it portable to carry it on site, labs, or anywhere to take measurements. The weight of the instrument is 26lbs/12kg which is half the weight of traditional gas volume testers (66lbs/30kg). Using the preexisting and current data obtained by "CooRe", a calibration curve can be created and a coefficient can be programmed. Measurement values are automatically computed based off the past data, which means no stored data is wasted. Refractometer technology that ATAGO cultivated for many years is incorporated into this gas volume meter. Two types of measurements can be measured at once which contributes to improved work efficacy. To measure, it only requires 100mL of sample. If the capacity is that of the common soda bottle, all containers can be measured. "Piercing" refers to when a tube is inserted to a container. This instrument allows anybody to pierce any type of bottles smoothly, whether can or bottle. 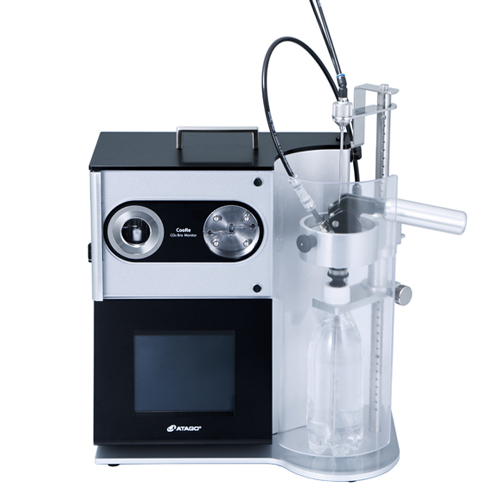 Moreover, it is equipped with a cover to prevent liquid from scattering when a bottle is removed from the instrument. Many of the gas volume meters are manufactured overseas. "CooRe" is made in Japan. 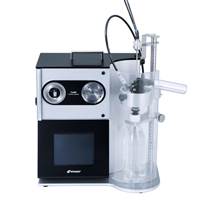 ATAGO will provide a full use of the expert technique that ATAGO cultivated in a refractometer for 70 years. In the event that any servicing or repair is required, please contact ATAGO. CooRe is the world’s first all in one dissolved carbon dioxide monitor that features three functions of	piercing a hole in the container (piercing), measuring dissolved carbon dioxide and concentration in a single measuring device. : 0.000 to 12.000 vol. *Applicable only if the USB terminal cover is on and power terminal cover is on (or AC power is connected).